On August 24, 2015, for the first time ever, 1 billion people used Facebook in a single day (24 hours), as Mark Zuckerberg announced on his Facebook account. On September 22, 2015, Instagram announced on their blog a new milestone: 400 million Instagram accounts. Nowadays there are a lot of social media networks and for a new small business, it’s hard to know which are the most useful and relevant social networks they can start with. At the beginning of every year, all the Internet users (marketers, small business owners and social media enthusiasts in particular) have one important question in their mind: Which will be the top 3 most useful social media networks in 2016 and why? 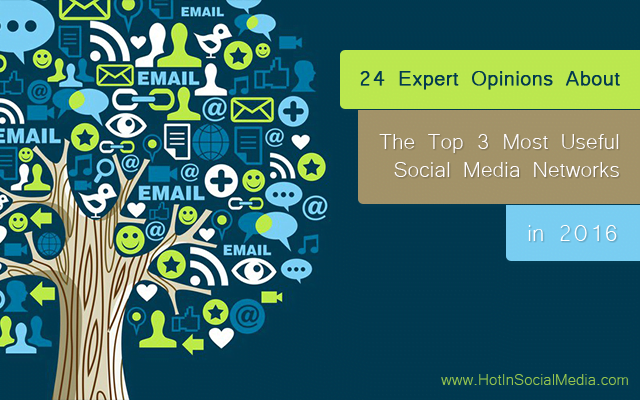 24 of the well-known social media experts have answered this question for our audience and you can read their answers below. Which will be the Top 3 Most Useful Social Media Networks in 2016 and why? · Facebook: Because of their insanely huge reach and fantastic ad targeting. · Twitter: Doesn’t have as much reach as Facebook, but has similarly awesome ad targeting and much lower advertiser competition. · Instagram: Ridiculously low advertiser competition, same awesome ad targeting options as Facebook, reasonably large reach (bigger than Twitter, smaller than Facebook). 1. Facebook – Facebook will continue to be an important player but the Facebook advertisement is the way to reach your audience. Most brands will struggle to get sufficient organic reach. 2. LinkedIn – This is and always will be a very powerful social network for businesses but, unfortunately, most businesses don’t take advantage of it. 3. Twitter – I thought Twitter would decline in use but with the recent announcement of integration with Periscope we’ll see a resurrection of Twitter in 2016. Answer: For me that works in a B2B market the three most important networks are Twitter, LinkedIn, and Facebook. Sales people need to build their personal brands and build relationships with prospects and influencers and these are best the best place to do it. Note: LinkedIn is only 30% of the Social Graph which is why Facebook is not just for friends and family, it is an integral part of the Modern Sales Person’s “kit bag”. Google+ is back to being cool again! And ‘Collections’ will allow people to focus, to niche their content and gain a solid following around these verticals. I think Facebook’s live streaming will be one to watch, but Periscope’s community is has grown to be very strong very quickly. YouTube is the one that has the best Search engine attached, and already has the ‘Cardboard’ button for uploads. If VR kicks in next year, then they could all win. It is a big market. 1. Instagram – With over 400 million active users, I like to think of Instagram as a beautiful magazine. This is the app where people go to scroll for entertainment and inspiration. It’s also a great creative outlet for businesses or anyone looking for a positive distraction. 2. SnapChat – SnapChat provides a huge opportunity to gain an instant connect with your audience. With a limited time period (24 hours) to view your snaps, you are providing your customers with an unedited, behind-the-scenes snapshot of your business. All of this helps to build trust between you and your audience. 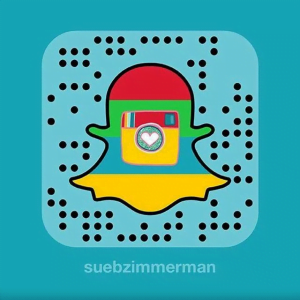 Don’t forget, E-commerce is coming to SnapChat, brands are already jumping on board. If you’re unsure of how to get started to take a look at my snaps. Of course, I branded my image bc I am all about being cohesive in all I do. Answer: This is a difficult question because different social platforms are valuable to different people/brands, and for many different reasons. I am not comfortable generalizing. Answer: Facebook will remain the best network for advertising. Instagram will continue to be an e-commerce powerhouse, and Pinterest will be the first truly social search network. 1. Instagram – As I mentioned above, this will be huge for brands that are looking for ways to connect visually with their target audiences. 2. Facebook – Marketers have apparently changed their minds about the power of this social media platform for attracting potential clients. Boosting posts and buying advertising seems to be working out well for many small businesses. Facebook also continues to enhance its capabilities for visual marketing. 3. LinkedIn – Although LinkedIn isn’t considered a true social media network, it is still a super platform for networking, sharing content, and having conversations with like-minded professionals. With the recent changes LinkedIn has made to Groups (less spam, more quality), people are warming up to them again, too. 1. LinkedIn – LinkedIn continues to be the most reliable business network. It’s easy to use and users can choose to just have a profile or actively engage, without penalty. The segmentation options offered to marketers are fantastic. As LinkedIn keeps improving their mobile app, I expect them to gain many more mobile users who will “connect” or read blogs and news on the network. The groups and the opportunity for anybody to blog just work and there’s tons of quality on LinkedIn. 2. Twitter – While Twitter is going through some growing pains – and time will tell if @Jack Dorsey can bring the anticipated positive change – it’s still one of my favorite platforms as it makes it so easy to engage. Used properly, which means one not just publishes but builds relationships, Twitter can be an amazing way to connect and collaborate with influencers, employees, and clients and to build thought leadership. In my book, it’s good that Twitter has a steep learning curve, as it means that those people who get on it have a serious intend (at least many of them). 3. Quora – Quora is not a marketing social media platform. To gain recognition, one has to answer lots of questions and ask good ones. But over time, it’s possible to build thought leadership and relationships. But the key reason I mention Quora here is that it is extremely useful to get a pulse on your market, competitors and what the big questions people ponder. Having been on Quora almost from the start, I get a lot of questions sent to me directly to answer in the social media realm. I then also see the answers other people provide. At the same time, I see some questions that show the level of ignorance that is out there about marketing and social media. All important pieces of the puzzle to understand the true landscape your business operates in. Answer: It’s impossible to answer this question. For many, Facebook will be the most useful, but there are many for whom it won’t be so good. For others, Snapchat could deliver them amazing results, but a heap of brands will find no value in it. It’s impossible to say because each brand, just like each person, is different and they’ll find utility and value in very different things. The most important thing, on this front, is to work out what resonates best with your audience and be where they are. Even if you don’t personally like Twitter, if that’s where your audience is, that’s where you have to go. The only true rule of social media is ‘your audience rules’. Why? Because they speak to the trends we will see in the new year. The most important social networks for each business or organization will be different due to their goals and objectives. However, the three networks above offer image and video opportunities that will be a “social media marketing sweet spot,” for many business types. Answer: Social networks are useful to you based on your goals and your target audience. It all depends on your business, your organization, and your specific clients or customers. If you are in the fashion space, Pinterest is a must for you. If you are in the tech world, you need to be on Twitter. I also think that live video streaming sites like Periscope and Meerkat will become more utilized and useful for digital marketers going into the new year. Answer: This answer stinks, but it depends. If you’re a B2B organization, it’s going to likely be LinkedIn, YouTube, and maybe a live streaming app. If you’re a consumer business, it’s likely going to be Instagram, Blab, and Facebook. But there isn’t a one-size-fits-all. Find out where your customers hang out and go there. 1. Facebook – Their ads are still some of the best performing social ads. I think people will continue to grow their businesses using Facebook because of the reach and ROI. YouTube- I think video will continue to dominate a large part of social and people will focus on creating high-quality videos and using ads to drive traffic to their videos. Instagram- I think Instagram is not a great platform but since the addition of video, Instagram is a hugely popular platform and I believe slowly but surely continue to grow and do great things for peoples businesses. 2. YouTube – I think video will continue to dominate a large part of social and people will focus on creating high-quality videos and using ads to drive traffic to their videos. 3. Instagram – I think Instagram is not a great platform but since the addition of video, Instagram is a hugely popular platform and I believe slowly but surely continue to grow and do great things for peoples businesses. Answer: The 3 most useful social networks will depend entirely on who is using them. For example, as someone who writes about marketing, I’d personally find niche social networks like Inbound.org and GrowthHackers.com more useful. But, if I was in my teens and wanting to keep in touch with friends, I’d likely find WhatsApp, Instagram and Facebook more useful. Which social network will be the most useful comes down to what you’re trying to achieve, and who you’re trying to reach. Randy is an entrepreneur, marketer, author, and blogger of online marketing, SEO & social engagement topics. A 4x author, he’s also a stage IV Cancer Survivor who has been seen in: forbes.com, business2community.com, steamfeed.com, socialmediatoday.com, financialpost.com, spinsucks.com, the CTV News, and recently, the was featured nationally in the Financial Post Magazine: Entrepreneur/Innovator edition, athe rticle titled: Keep Running. LinkedIn – Members are seeing more engagement metrics, from who ‘liked’ to who ‘shared’ and, of course, the ‘who commented’ is still there. (These features previously were available only in GooglePlus, though Google recently removed them.) These engagement tools allow you to reach out and engage with active connections. – Recently updated Mobile apps are fantastic. On iOS, engagement tools are more robust, very similar to the desktop version. Instagram – Users can easily attract fans by posting great content that stays on topic. Important to keep in mind that true, loyal fans will never be as big in numbers as the trendoids can be. It’s not a numbers game. – Users can avoid poorly targeted ads by keeping their activity ‘on topic’. – Find and connect with more fans using Instagram’s very helpful search feature (by hashtag, name, topic, and by popularity). Get to know the leaders and engage – their following will rub off on you nicely. – Paid advertising is only necessary to grow impressions (might want to keep an eye on what’s truly measurable) and (provided your content is great) to attract fans. – Side note: the majority of poorly targeted ads appear in users’ feeds because they have been indiscriminately liking, following, and sharing off-topic content. Yes, users attracted annoying ads that way. Avoid them by being more selective throughout your activity and by blocking advertisers you don’t wish to see via the ‘sponsored’ button on each ad. GooglePlus – An avid Plusser, Google Plus would normally be at the top of my list. However, recent changes to both Pages and Profiles have left me just a little annoyed (ok, a lot annoyed) at Google. Profiles have a few cool new functions/features such as Collections which are pretty nice, but the Pages (business pages) have been stripped to the point of hardly being useful any more. I’m dearly hoping the engagement features of the classic Pages return, or I fear I’ll be joining Google Plus ghost town crowd. 1) Facebook has become the common ground for the majority online networking so it will remain important for business and individuals in 2016. Facebook is continually innovating to provide new services or features to keep users and advertisers retained on their platform. Updates like “Reactions” will give marketers a better indication of how their campaigns are performing. 2) Pinterest has been rolling out a bunch of recent e-commerce related features. I would definitely take some time looking into that platform in 2016 if you haven’t already. A good way to tell if you should be active on Pinterest is to see who has already pinned content from your website without you even knowing it. 3) I’ll be adding the ‘social’ to my social strategy by utilizing new platforms like Blab.im. Live streaming will allow me to build and maintain the digital relationships I’ve developed with colleges, mentors and prospects more authentically in 2016. Answer: I would stick to Facebook, LinkedIn and Pinterest. Facebook because it is extremely versatile and I could do anything with it thanks tothe Facebook advertisement. Plus, it is extremely cheap too! LinkedIn because it is a great place to connect with business minded people. Sure, there are a lot of spam on LinkedIn but it is still a great source especially in some industries. Pinterest is probably a no-brainer. People love images and Pinterest is a must have regardless what business or niche you are in! Answer: Facebook, Instagram, Twitter … plus, LinkedIn and SnapChat 2016 doesn’t look to be the year that Facebook & Twitter will falter from the top, but there is no denying users are slowly dropping. Others will definitely rise and Instagram definitely does not seem to be going anywhere. SnapChat is a for sure a growing mainstay – not for every brand but as a new form of entertainment and messaging it’sa direct form of messaging combined with the television type easily accessible long-form content its a massive game changer for advertising. LinkedIn looks to be the B2B leader and I will be curious to see what new products and developments they release. The trend I see evolving is the ability to keep users in an app. Both SnapChat and Instagram don’t provide clickable links, so this means marketers need to create innovative ways to keep users intrigued about their clients products and services within an app. Not an easy feat – training followers to click from a link within a profile and not the post itself on Instagram is a huge game changer. 1. Video conversation and live chat (i.e. Blab) is a powerful combination which businesses and brands should be paying attention to in 2016. Simple, easy-to-use, sharable (Facebook, YouTube, iTunes), and it’s high quality. The conversational piece puts it above the crowd in my eyes. Could Blab be the next evolutionary step (and replacement) for podcasting? I think so. 2. Facebook (if you’re willing to pay*) has some excellent advertising opportunities. Over the last year, they did a nice job lowering the entry barrier for small business owners who are often doing social media marketing themselves. Don’t get me wrong, Facebook advertising can still be quite complex and challenging, but you don’t need an instruction manual or take an online course to create effective ads today. *side note: “willing to pay” doesn’t mean budgeting hundreds of dollars months. For as little as $1/day there’re advertising opportunities. I think many would be surprised at the results a $15 / week local ad campaign. Facebook is a “pay to play” platform and businesses need a dedicated (not large) budget to support those efforts. Answer: The top 3 most useful social media networks in 2016 will be Twitter, Instagram and Facebook. While new networks are trendy, the older ones have the most robust audience base and targeting tools. Answer: Facebook, LinkedIn and Twitter. Facebook still dominates the social world, Twitter is unmatched in terms of real-time conversations, trending topics and hashtag use, while LinkedIn is best for professional networking (which every individual and business can benefit from). 1. Instagram – I saw a recent stat that only 36% of marketers use Instagram. That means that Insta users are not inundated with business messaging. If a business can manage its messaging to “fit in”, there’s a lot of room for this to be a useful outlet. 2. Facebook – It’s still the granddaddy of all social media, and even with its issues, it’s still very widely used. The ads and boosted posts can be so very targeted that money spent here can have a significant ROI. 3. Pinterest – Any company that spends time or money on blogging should be on Pinterest, sharing each blog post there. Same goes for any e-commerce company sharing links to their product pages. I’ve seen website visits skyrocket using this outlet. And now that Pinterest has buyable pins, anyone selling anything online is missing out if he/she is not using it.